• Do not use the cruise control when it may not be safe to keep the car at a constant speed, for instance, driving in heavy or varying traffic, or on slippery (rainy, icy or snow-covered) or winding roads or over 6% up-hill or downhill roads. During normal cruise control operation, when the SET- switch is activated or reactivated after applying the brakes, the cruise control will energize after approximately 3 seconds. This delay is normal. To set cruise control speed: 1. Push the CRUISE ON-OFF button on the steering wheel to turn the system on. The CRUISE indicator light in the instrument cluster will illuminate. 3. Push the SET- switch, and release it at the desired speed. The SET indicator light in the instrument cluster will illuminate. On steeper hills, with a Manual Transaxle, the cruise control may be unable to maintain the set speed. The driver should downshift as necessary. Press the "RES/+" button to resume the cruise control at the set speed in the new gear. After cresting the hill, upshift, and press the "RES/+" again. If the speed drops ~ 15 km/h (9 mph) below the set speed, the cruise control will cancel. If it cancels, shift to the appropriate gear, and press the "RES/+" to resume the cruse control. Follow either of these procedures: • Push the RES/+ switch and hold it. Your vehicle will accelerate. Release the switch at the speed you want. To decrease the cruising speed: Follow either of these procedures: • Push the SET- switch and hold it. Your vehicle will gradually slow down. • Push the SET- switch and release it immediately. 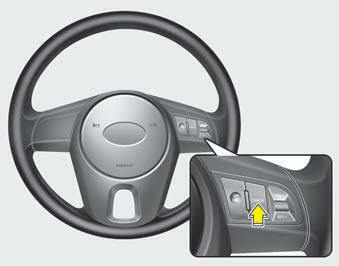 The cruising speed will decrease by 1.6 km/h (1 mph) each time the SET- switch is operated in this manner. If any method other than the CRUISE ON-OFF switch was used to cancel cruising speed and the system is still activated, the most recent set speed will automatically resume when the RES+ switch is pushed. • Push the CRUISE ON-OFF button (the CRUISE indicator light in the instrument cluster will go off).